The Kingdom Hearts series is one of the top-selling RPG brands in the world. It’s hard not to be cynical about its origins, as it was a clear attempt to mash together two things that are very popular, especially in Japan, to see how much money would come out. The answer was, a lot. To the credit of the various development teams who have worked on the franchise, they’ve made the best of a very unnatural mash-up. The original game sort of coasted on the goodwill of fans and largely inoffensive gameplay, but some of the follow-up games have been surprisingly high quality. Even the failures have tended to be interesting experiments worth messing around with just to appreciate their quirkiness. The extremely long interval between Kingdom Hearts 2 and Kingdom Hearts 3, eleven years and still counting, has wreaked havoc on the story as prequels and sidequels and even midquels are jammed into an already messy continuity. It’s been good for the games, however, as they’ve been allowed to explore a variety of concepts in an effort to keep things fresh without moving the plot ball forward. 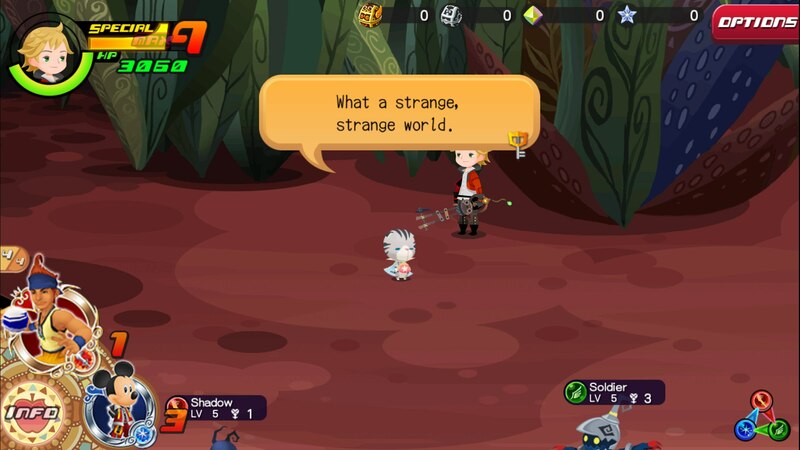 That’s where we’re at with Kingdom Hearts: Unchained Chi (Free), a free-to-play social RPG that takes place during the Keyblade War, long before the events of the first game in the series. Don’t worry too much about the story stuff. I mean, that’s good advice for the series in general, but you really don’t have to worry about it here. The premise is just there to give you an excuse to travel from Disney world to Disney world, searching out enemy Heartless monsters and beating them to death with your giant key. Naturally, you’ll come across various Disney and Square characters in your travels. They’ll ask for your help with a variety of things, but they all amount to wiping out whatever enemies are lurking around. After a set number of these short missions, you’ll fight a larger boss and eventually make your way to the next world. Your player character looks kind of weird, but the familiar Disney and Square characters all look quite good, even if they are rendered in a slightly different style from the other games in the series. Most of the returning characters only make appearances in the game in the form of Medals that you equip to your keyblade, however. These Medals indicate the power and property of your attacks, and also allow you to pull off a special move. Sadly, the characters are limited to static pictures on the Medals, so you won’t get to see The Beast coming in and pummeling monsters for you or anything. The battle system is very simple. Each turn, you can use your medals to attack the enemy. You can tap on one enemy to do a powerful focused attack, swipe across the group to do a weaker strike that hits everyone, or touch a Medal and swipe to unleash a special move. When you’ve used all of your Medals, the enemy takes their turn. Special moves require you to have your special meter stocked up, so you’ll want to make sure you don’t waste your meter on weaker enemies. The game offers a variety of incentives if you can finish battles in a single round, something that is relatively simple to do if you plan your moves even a little. Enemies, Medals, and keyblades all possess one of a few different elements, forming a rock-paper-scissors triangle of strengths and weaknesses. Pulling off single-round victories in the long run will require you to pay attention to those elements and take advantage accordingly. Each mission will have you run through four or five of these battles at most. You get a little area to run around in, so if you want to avoid some battles, you can, but there isn’t much point in doing so. Non-boss battles are over in seconds, and many of the level rewards are tied to beating all of the enemies in the stage. Apart from the battles, there isn’t much to do in each stage. There are some items and chests laying around that you can scoop up by running over them, but that’s about it. You’ll want to grab all of that junk because you’re going to need it sooner or later for upgrading or evolving various things. 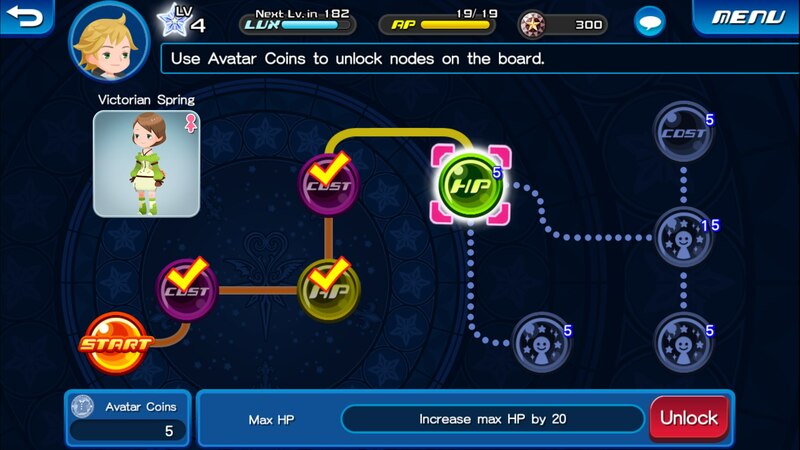 There are a lot of different upgrade systems in play in Kingdom Hearts: Unchained Chi. Medals work like characters in any social RPG. You can feed other Medals to them to raise their level, and if you have the right materials, you’ll eventually be able to evolve them to a stronger form. You’ll come across some Medals in the missions or as rewards, but most of them are so weak they’re pretty much just there to sell or feed to your good Medals. You can also upgrade your keyblade, increasing its stats and opening up extra Medal slots. Your character has a level of their own which raises based on clearing missions, and even your clothes have things to upgrade. Each set of clothes you come across contains what’s called an Avatar Board. You can spend special Avatar Coins to unlock slots on the board, each one containing a stat increase or an extra customization option. It’s like a simpler version of Final Fantasy 10‘s Sphere Grid. As with any social RPG, there’s a premium currency greasing many of the wheels of the game. Jewels can be used to pull a random Medal, refill your stamina meter, increase your inventory maximum, and so on. You’ll earn some Jewels for clearing stages, and the game awards them as login bonuses every few days, so if you’re playing without paying you can still get what you need to move forward. If you’re looking for particular characters, though, you’re either going to have to be very lucky or very patient with what the game gives you, or spend some real money for some Jewels. The going rate for them is pretty similar to other social RPGs, so you’re looking at spending at least a few dollars for a random Medal pull. 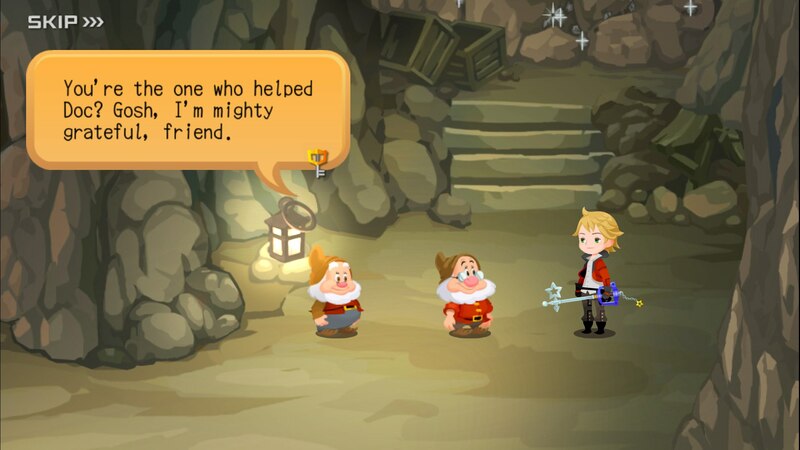 I should stress, though, that you can definitely get by in Kingdom Hearts: Unchained Chi as a free player. It’s a bit tougher, but it’s doable. The real question is whether you want to do it or not. In terms of gameplay mechanics, Kingdom Hearts has very little going for it. The battle system lacks the depth of many other social RPGs, and with the exception of the Avatar Board, virtually every other mechanic in the game can be found in just about every other RPG. It’s not poorly done by any means, but from a purely mechanical perspective it’s a very bland game. Its appeal, then, falls along the same lines as the original Kingdom Hearts. 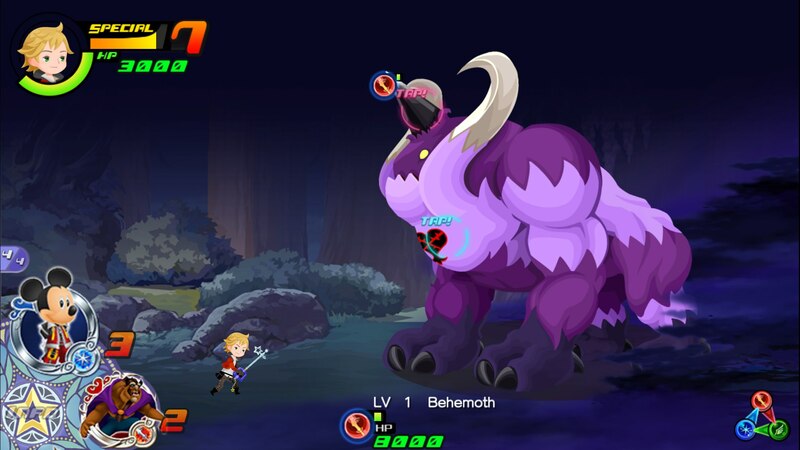 If you love these characters and are excited by the idea of bouncing around Disney worlds battling Heartless with your favorites by your side, you might enjoy Unchained Chi more than other social RPGs. Although the game uses a different, more economical-looking art style, the visuals are still on point. Better still, the game’s music is all drawn from the original games, which means this game is packed full of wonderful compositions and arrangements from Yoko Shimomura. At least in my case, that wasn’t enough to hold my attention over the long term. I played this game for a while after it released in Japan, but the mindless nature of the battle system gave me little reason to come back once I got my fill of the aesthetics. It’s a shame, because from a presentation standpoint, Kingdom Hearts: Unchained Chi is really well done. Well, apart from the usual overly-complicated UI, anyway. It’s also reasonably fair relative to many other popular social RPGs, allowing you to make steady progress even if you don’t feel like doing a Monstro impression. Much like the very first game in the series, however, it’s passing off mediocre, perfunctory gameplay by wrapping it in a nostalgia-laced candy shell that makes it nearly impossible for fans to resist. If you love any of the associated franchises, it’s worth giving the game a go, at least for a little while, but it’s too bad that the lessons learned in the core Kingdom Hearts games seem to have been ignored here.